Summary: The Asus VivoBook S530 improves on last year’s VivoBook S510 and should be one of the most popular notebooks in its class of compact and affordable all-round computers in 2018. Most of the improvements are aesthetic though, corroborated with a hardware update and a new and slightly more comfortable to use keyboard, but potential buyers would still have to live with the rather small battery life and dim IPS screen. 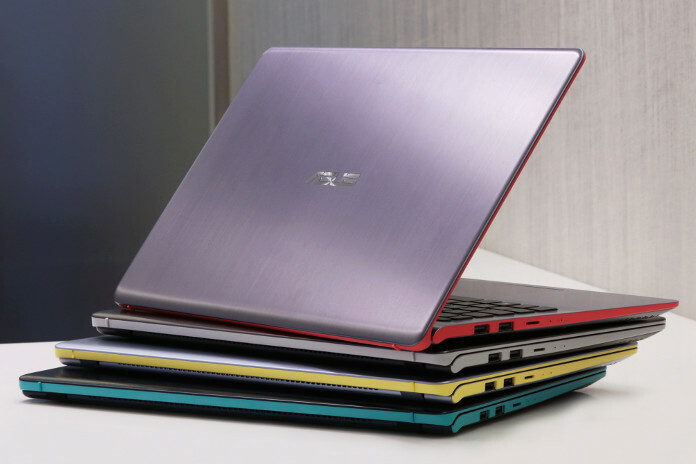 If you’re shopping for a mid-range everyday computer in the $600 to $700 price-range, you’ve surely came across a few Asus VivoBooks options. 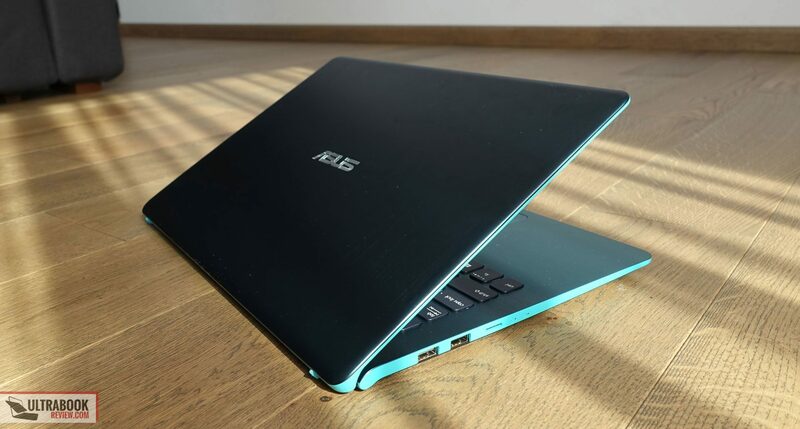 As of the second half of 2018 Asus offers an updated model in this niche, the VivoBook S15 S530, also known as the X530 or the F530 in some regions. Asus have an awfully confusing naming policy for their devices, but their computers are actually some of the better you can get for your buck in their niches. 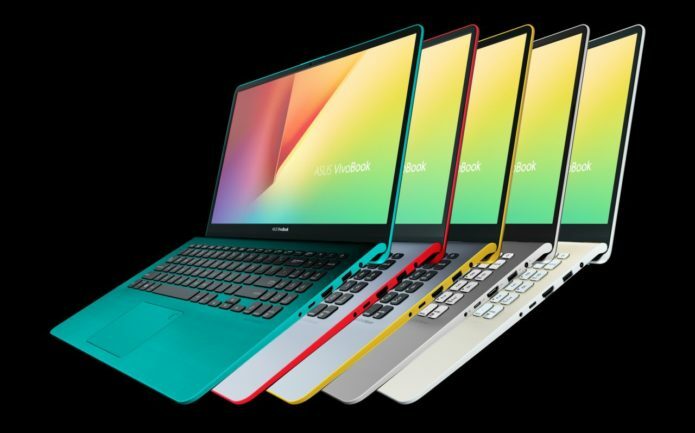 The VivoBook S530 builds on last year’s VivoBook S510 series with a new design, new color schemes, a new keyboard and an updated hardware platform. The entry level models are expect to start at about $500, with the good all-rounders powered by a modern i5 processor, with 8 GB of RAM, 256 GB SSD storage and an IPS FHD screen going for around $700 at launch. We’ve spent time with the VivoBook S530UA model and gathered our impressions below, with all the strong points and the quirks you’ll have to accept if you decide to go for one of these. 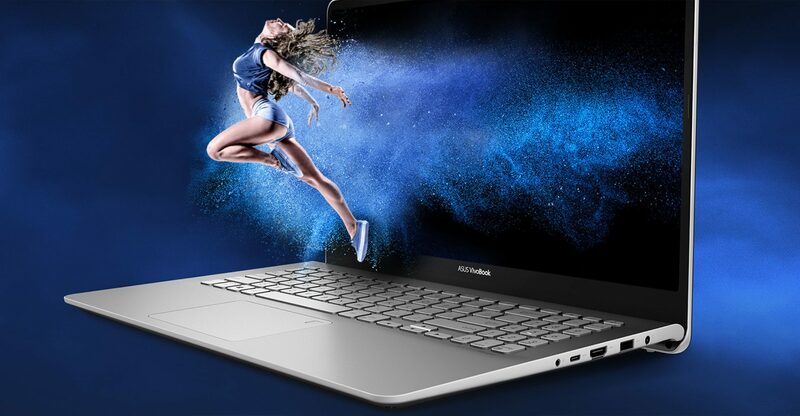 As already mentioned in the intro, the S530 series is also available as the VivoBook X530 in some regions of Europe, or as the VivoBook F530 with some US retailers. As far as we know, these are all the same. 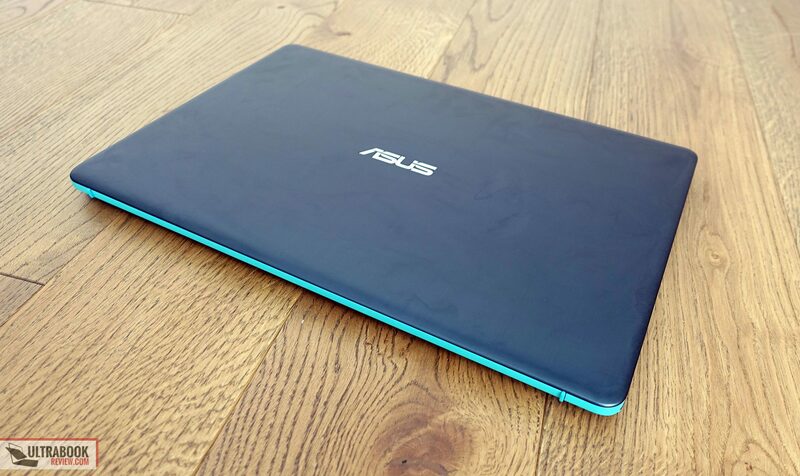 Aside from the S530UA models, Asus also offers a VivoBook S530UN configuration, similar to the one reviewed here, but also quipped with a dedicated Nvidia MX150 graphics chip, for those of you interested in running some light games on your machine, albeit the MX150 is still an entry level solution and can only do so much. 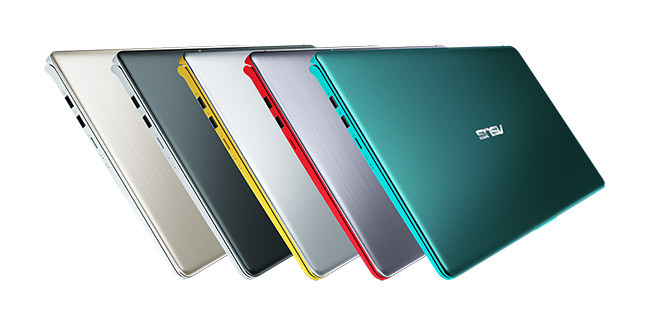 Aesthetically the S530 has a few particularities that make it stand out of the crowd. 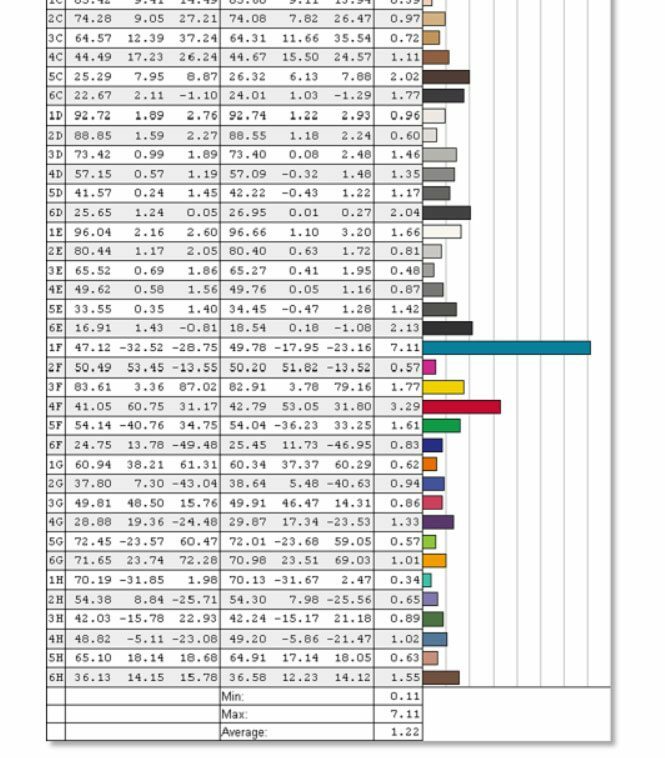 First of all, there are the color schemes, as this series is available in either Icicle Gold, Gun Metal, Silver Blue, Star Grey or Firmament Green, as you can see in the pictures below, each with different color shades for the interior, outer shell and the trim around the edges. We got to test the latter, the green option. 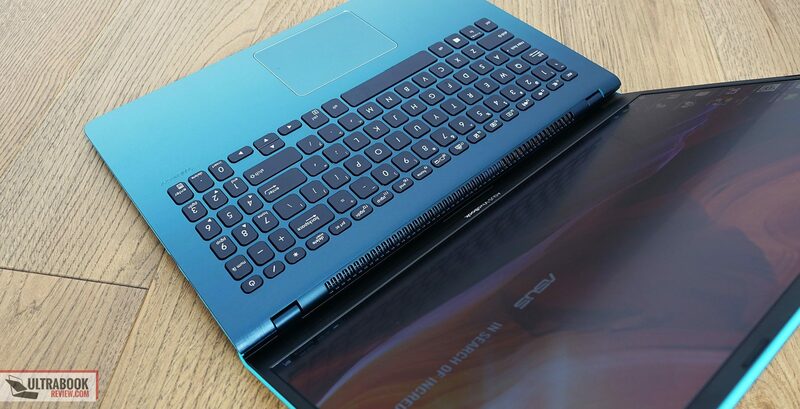 Then there’s the overall screen hinge’s design, as Asus implemented their ErgoLift design that we’ve also seen on the premium Zenbook UX391 series, which lifts the main body on the lower part of the screen and allows for better airflow underneath, as well as a slightly inclined and more ergonomic typing position. 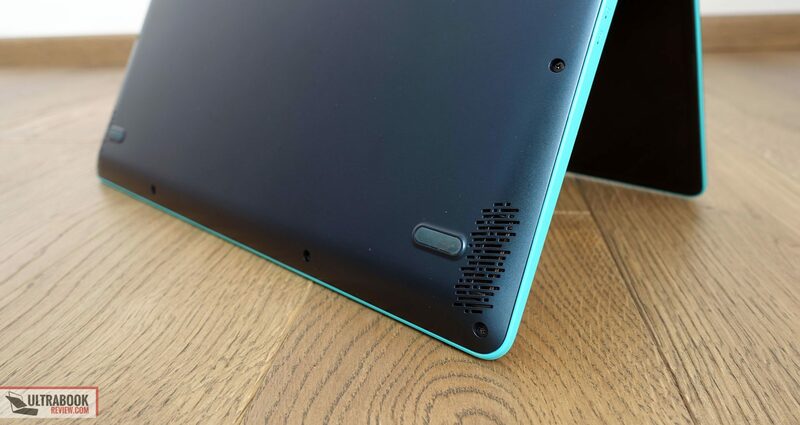 I like this approach and I also like that the laptop remains stable on a flat desk, despite the fact that the contact points on the screen’s lip are tiny, but they are rubbery and grippy enough. I’m not so sure how they’ll do over time and how fast they’ll wear off. Last but not least there’s the smaller bezel around the top and sides of the actual display, as well as the new textured material used for the interior, which I’d reckon should age better than the smooth surfaces on some of the older VivoBooks. 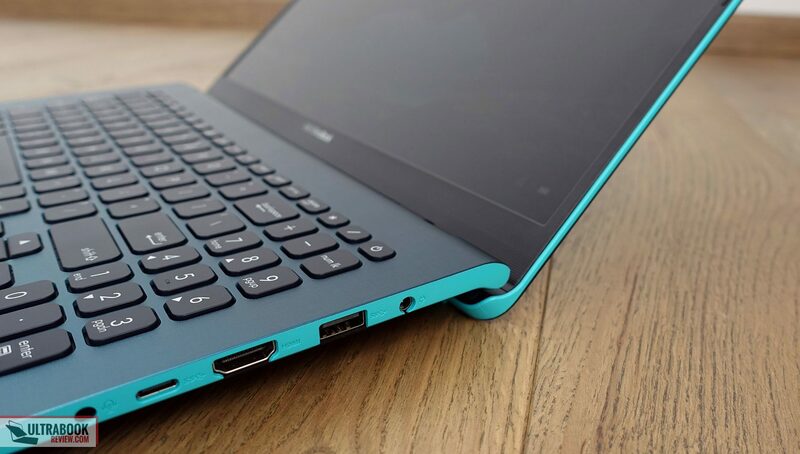 Despite those smaller bezels though, the VivoBook S530 is in fact marginally larger and heavier than the previous generation, mostly due to the implemented ErgoLift hinge. As far as the build quality and choice in materials goes, the S530 is still mostly made out of plastic, with a sheet of brushed metal covering the hood, and there’s still some flex in the main body and keyboard deck, although the overall build seems a little bit sturdier than on last year’s S510 models. This laptop is also fairly practical. There’s a notch that allows to easily lift up the screen with a single hand, there are no sharp bits and corners, the palm-rest is spacious enough to accommodate your hands and as mentioned earlier, it sits nicely on a flat surface. The hinge only goes back to about 140 degrees, which is fine for desk use, but rather limiting in other situations. Flipping the laptop upside down you’ll notice a very simple plastic underbelly, with a smooth texture, as well as cuts for the speakers and a small air-intake grill on top of the single fan that keeps the hardware at bay. The IO is lined around the sides, and there’s pretty much all you’d expect from such a computer, including a mix of USB-A and USB-C ports, HDMI for video output and a card-reader, but for some reason Asus went with a microSD option and not the full-size SD standard. We should also add that most of the connectors, including the power plug, HDMI and headphone jack, are on the right side, which can lead to unwanted clutter for right-handed users when connecting peripherals. 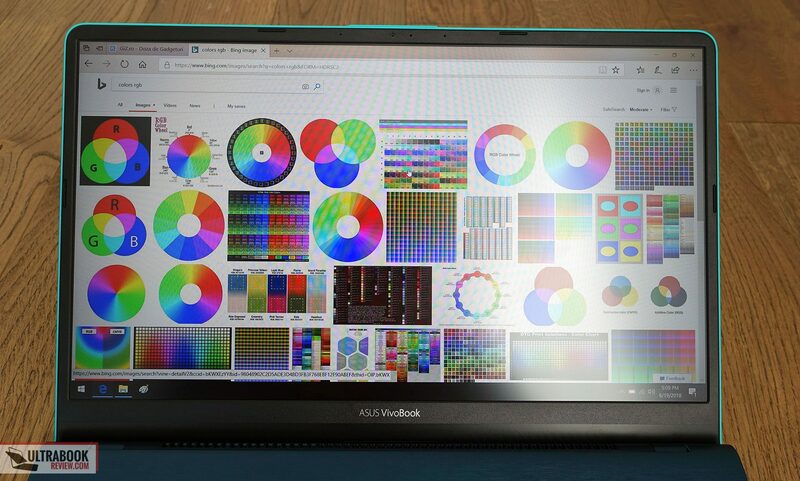 All in all, the VivoBook S530 is a nicely made and designed computer in its niche. I’m a fan of the functional ErgoLift design, the small bezels around the screen and the extra touch of color around the edges. Plastic is still used for the main body and Asus could still have made the inner deck sturdier, but overall this is something I could live with, given what else is provided. 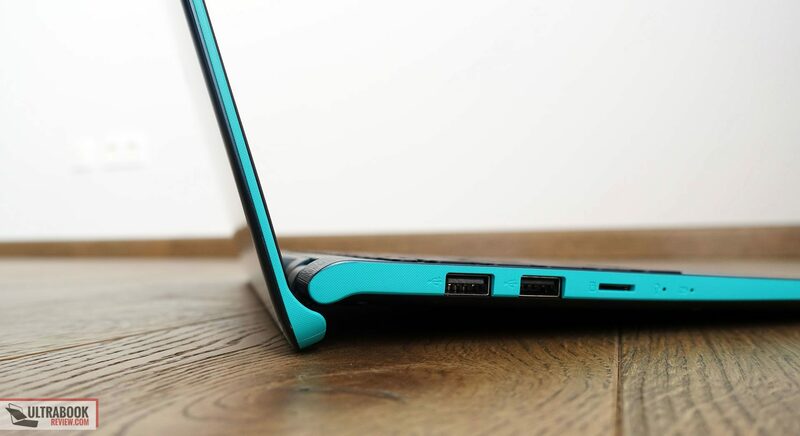 There’s a 15.6-inch screen on the VivoBok S530, with a matte finishing and narrow bezels around its upper and side edges, with still enough room to incorporate the webcam and microphones at the top. Asus offers two screen options for this series, a TN 1366 x 768 px panel and an IPS 1920 x 1080 px option. We’ve got the latter on our test unit and we’d recommended steering away from the TN panel, both the resolution and the viewing angles are just not worth it in this day and age. The IPS option is an LG Philips panel with average traits, but again, much better than the TN alternative: good contrast, decent viewing angles, but somewhat washed out colors and limited gamut coverage at 52% AdobeRGB. 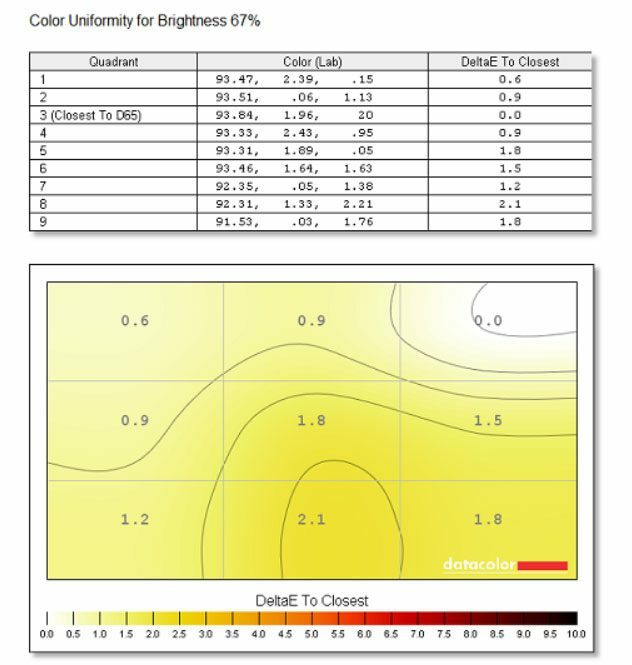 You can however improve on the gray levels, gamma and colors to some extent by using our calibrated screen profile available over here. 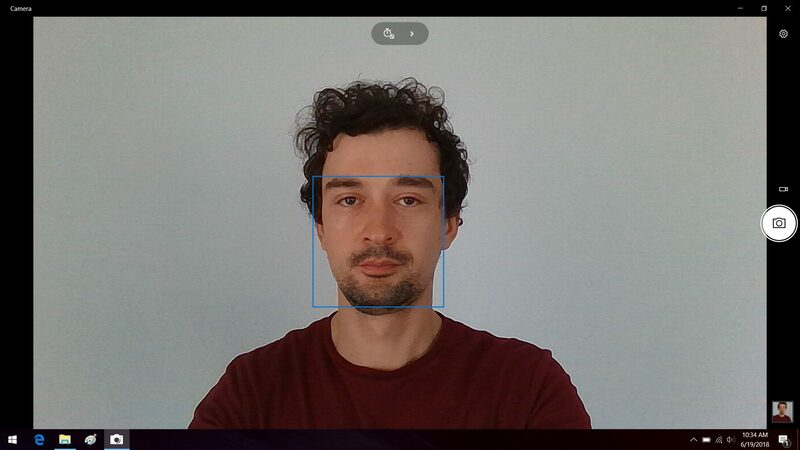 Average DeltaE: 2.50 uncalibrated, 1.22 calibrated. 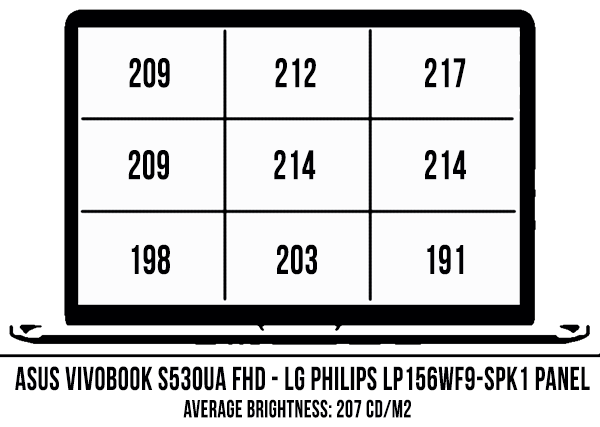 It’s also worth adding that this panel doesn’t use PWM for brightness modulation and is fairly uniform in colors and luminance, without any noticeable light bleeding or panel pinching around the edges. 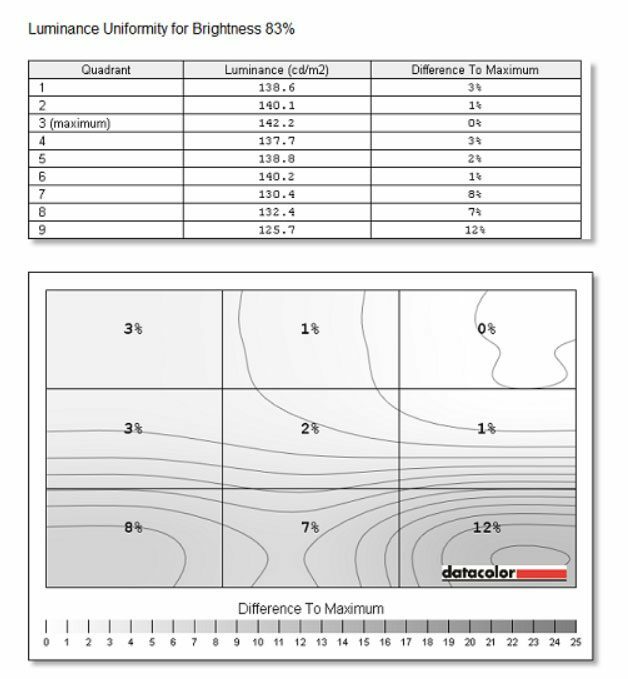 So while it’s mostly similar to the panels other OEMs use on laptops in the $600 to $800 price range these days and should do fine for everyday use and multimedia content, I still find the maximum brightness limiting, which should be a concern if you plan to use the computer in bright environments. 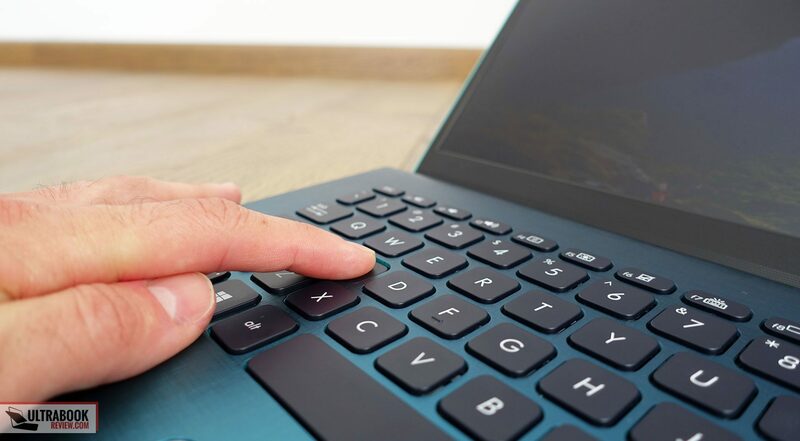 The typing experience of last year’s VivoBook S510 wasn’t that great due to the keys feeling shallow and the main-deck warping more than you’d want in a modern laptop. The 2018 update actually bundles a new keyboard and is overall a marginally better typer. First of all, the layout is pretty standard, with full-size main keys, nicely spaced directional keys and a cramped NumPad section. The F-keys are mapped as function keys by default, but you can change their behavior by hitting Fn+Esc, which is a standard implementation. 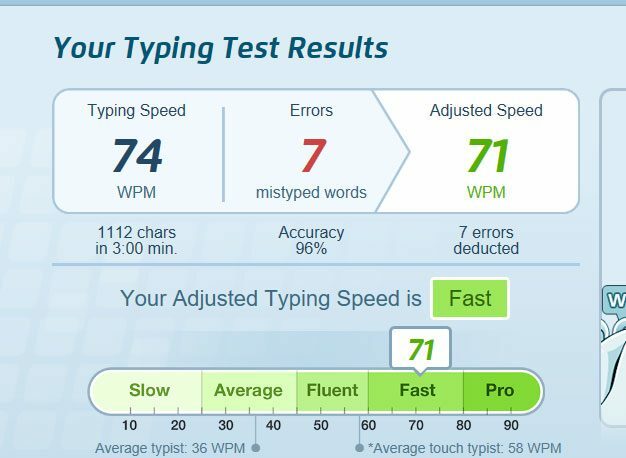 That aside, there’s still a fair amount of warping in the keyboard’s deck, but the overall feedback is firmer and I was able to type fast and fairly accurate once I got used to it. This keyboard is also backlit and quiet, so while those who type for a living might still not find the experience satisfactory, it should do fine for the casual user. 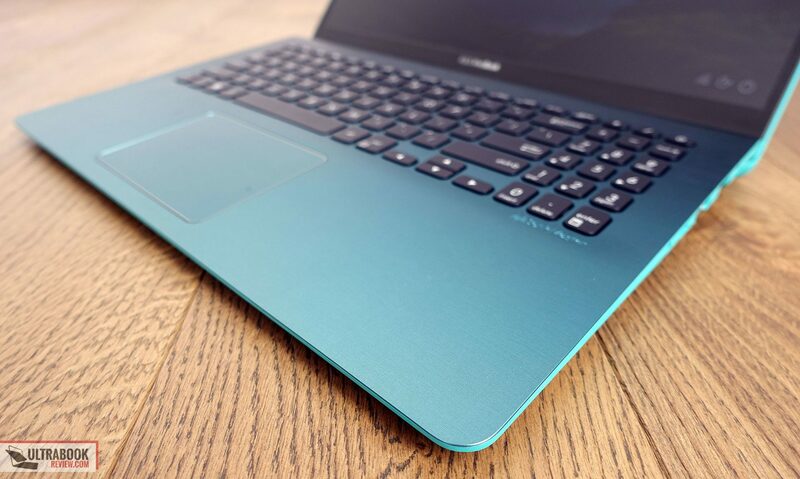 I’ll also add that Asus color matches the keyboards with the various exterior color schemes. For instance, while our version gets black keys, there’s a white keyboard on the Icicle Gold version and a silver keyboard on the Gun Metal variant. 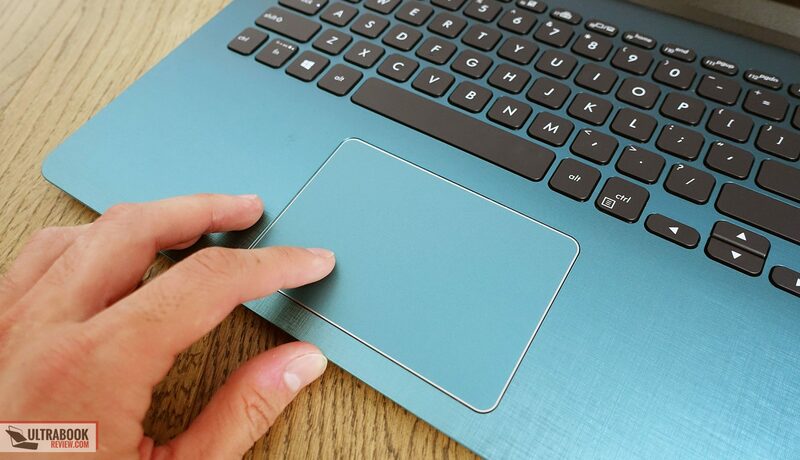 As far as the trackpad goes, Asus claims it’s covered in glass, but ours feels and looks like made out of plastic, so perhaps there are two variants, the plastic one that we got here and the one that also integrates a finger-sensor in the upper corner, which might be covered in glass. Our version works fine with swipes, gestures and taps, with no glitches and inconsistencies. 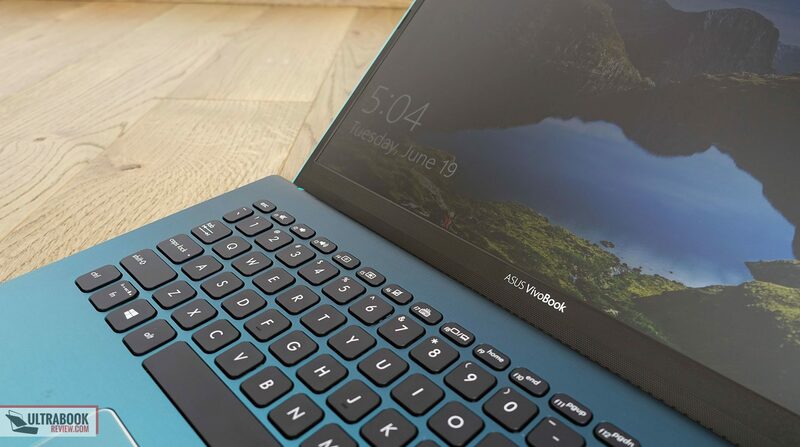 However, the surface is not that smooth on the fingers and the click buttons are stiff and not that nice to use. While we mostly got a higher-end configuration of the VivoBook S530UA for this review, with the quad-core Core i7-8550U processor and 10 GB of RAM, it only came with a regular HDD and no SSD, which has a significant impact on the everyday experience. Luckily most of the configurations you’ll be able to find in stores ship with an SSD, and in case you do decide to opt for one of the lower end variants with a HDD, adding an SSD is a simple task. For that you’ll just need to open the back panel, which is hold in place by a handful of screws, all visible around the edges. In here you’ll notice the two memory DIMMs, the M.2 80 mm SSD slot, the 2.5-inch storage bay and the wi-fi module, all accessible and easily replaceable. You can also notice the GPU’s slot, which is not bundled with this UA version. 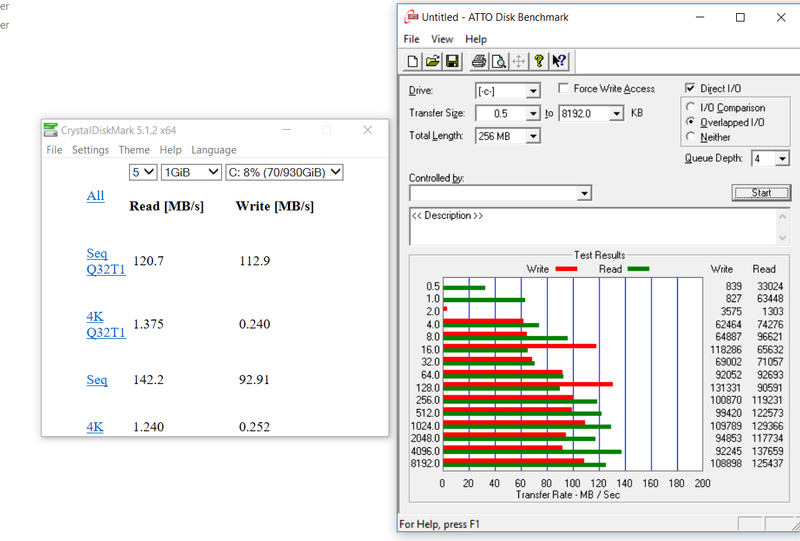 As far as performance goes, if we look past that lack of an SSD, with an impact on some of the benchmark results, the hardware runs very well on this build, both with everyday tasks and with demanding loads. 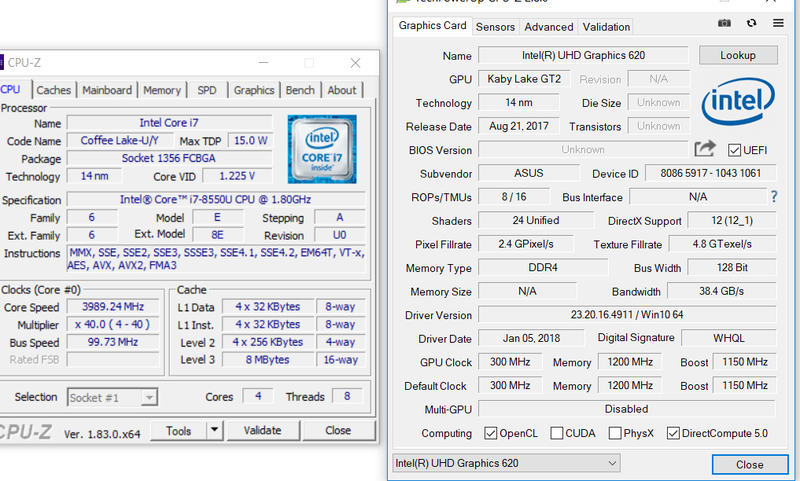 Asus’s implementation allows the CPU to draw up to 40W of power in Cinebench for a few seconds, settling down at around 20W for concurrent loads, which is still higher than the standard 15W TDP of most i7-8550U implementations. 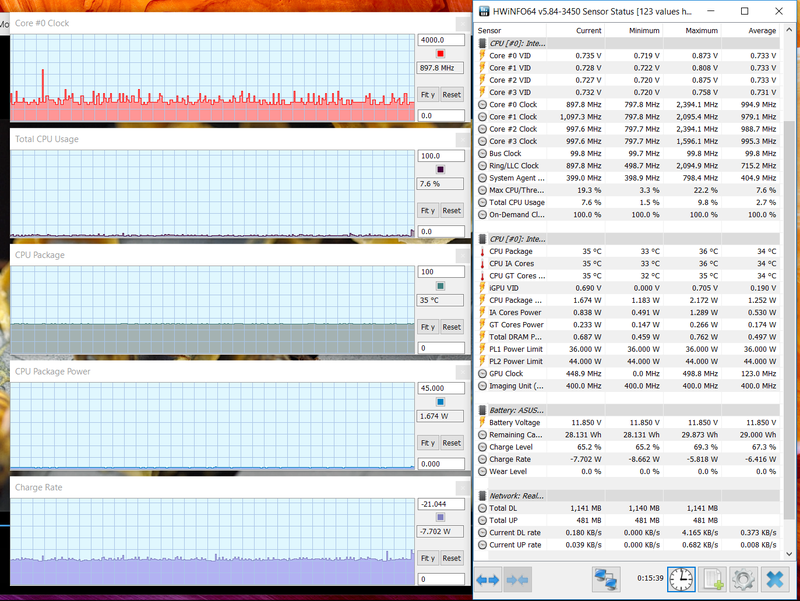 As a result, this laptop scores high in CPU benchmarks, as you can see below. 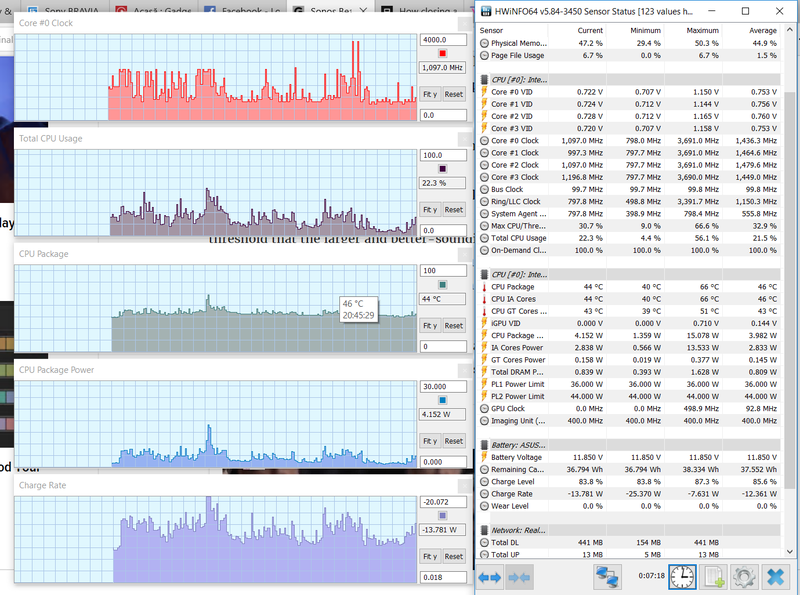 x264 HD Benchmark 4.0 32-bit: Pass 1 – 189.70 fps, Pass 2 – 39.31 fps. Performance in games and 3D graphics tasks is rather limited though, with the CPU clocking down once it reaches higher temperatures and the GPU only averaging clock speeds of around 900 MHz (from a maximum potential of 1150 MHz) in titles released in the last years. This is also visible in GPU benchmarks, with this implementation scoring lower than other Intel UHD 620 builds tested in the past. 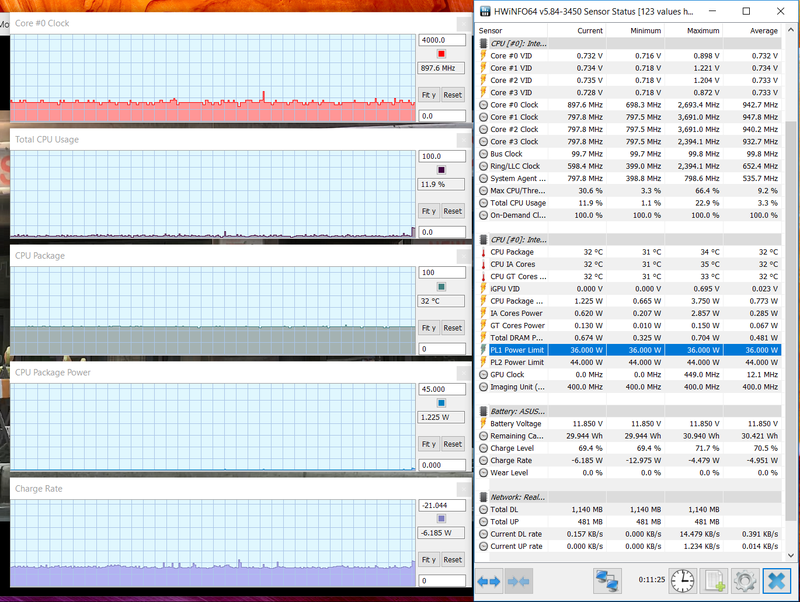 Undervolting can help a fair bit, but if you’re interested in running some games on this VivoBook you should opt for the S530UN configurations with Nvidia MX150 graphics anyway, as there’s still only so much you can squeeze from the Intel solution. We’ve yet to test that one, but hopefully Asus implemented the higher-end variant, which is actually a decent performer with light titles or older releases. Stay tuned for updates. 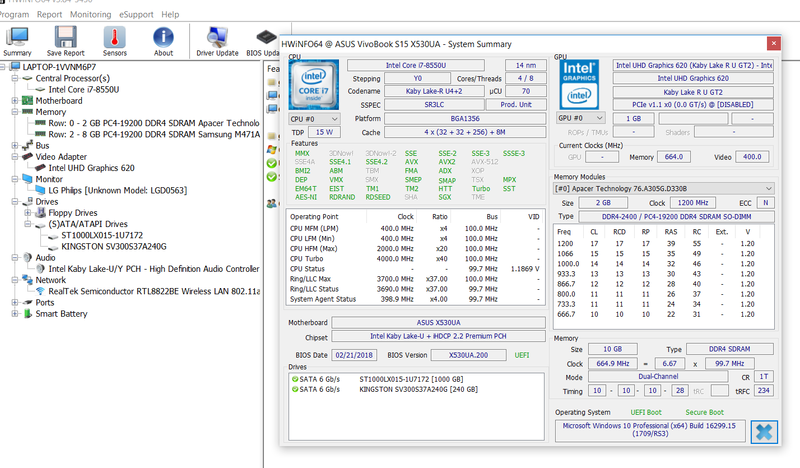 The cooling solution implemented on this laptop is simple and hasn’t changed from the older VivoBook S510 line, with one fan and a single heatpipe that runs on top both the CPU and dedicated GPU (on the S530UN models). 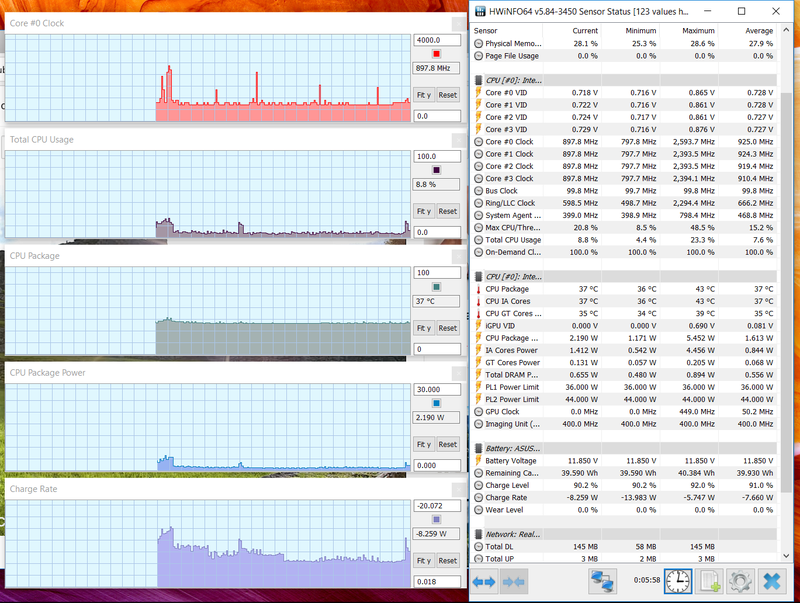 Asus opted for a different fan though, which proves to be quieter than the one we’ve seen on the previous generation. In fact, our test unit runs cool and quiet with everyday activities. The fan is active all the time, but pretty much inaudible in normal environments, and you’ll rather hear the mechanical HDD than the fan in this case. The fan ramps up with more demanding loads though, but it only goes up to about 44-45 dB at head level, a noise level that’s easily covered by the internal speakers. There’s very little to complain when it comes to the outer-shell temperatures as well, both with daily use and with games, as you can see in the pictures below. Just keep in mind the GPU performance suffered on our sample, so retail units might run a little hotter with demanding loads. For radios Asus went with a Realtek Wi-Fi AC chip on this build. It’s not one of those newer Wave 2 modules, but it performs well enough and we didn’t run into any glitches, issues or disconnects during our time with the computer. 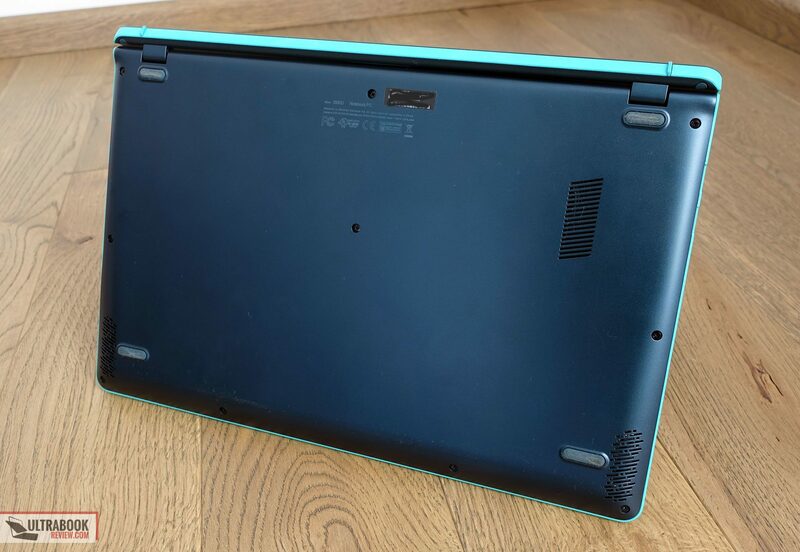 The speakers on this laptop are still placed on the belly, but fire through bigger cuts and were moved to the sides. They’re averagely loud, maxing out at 78 dB at head level, and their audio quality is about average. They still push vibrations through the palm-rest at volumes above 60-70%, but at least no longer distort like those on the previous generation. Asus also updated the webcam on this series, replacing the crap VGA unit on the S510 with slightly less mediocre HD camera on this line. It’s still not something to brag about, especially in poorer light. 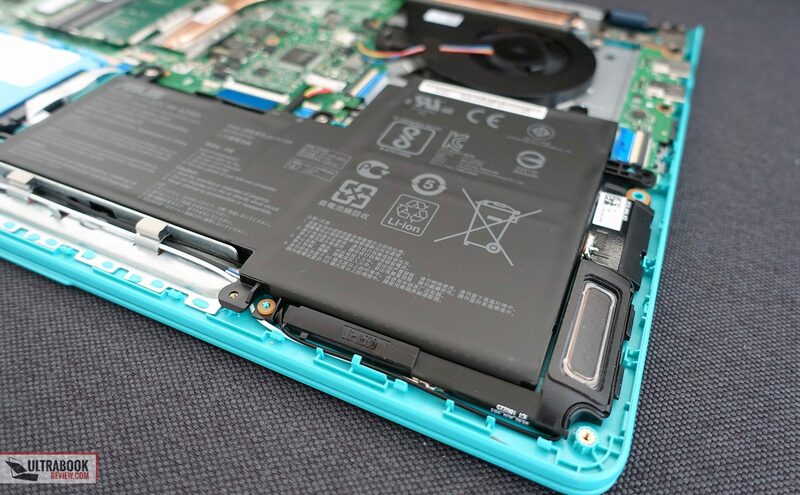 There’s still just a 42 Wh battery inside this 2018 updated of the VivoBook S15 and that’s small for this day and age. 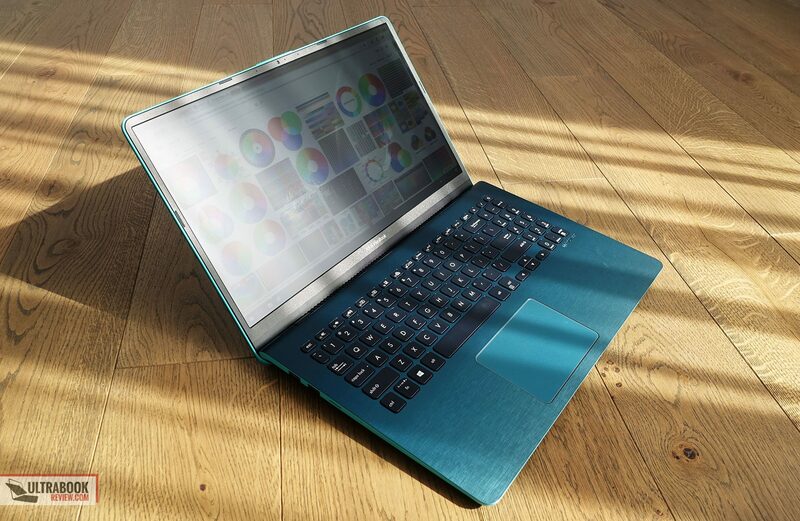 The hardware is efficient though and having a dim panel also helps keeping energy requirements low, but even so, this laptop won’t offer more than 3-4 hours of real-life multitasking with a single charge. Here’s what to expect, with the screen’s brightness set at around 120 nits (~40 brightness). 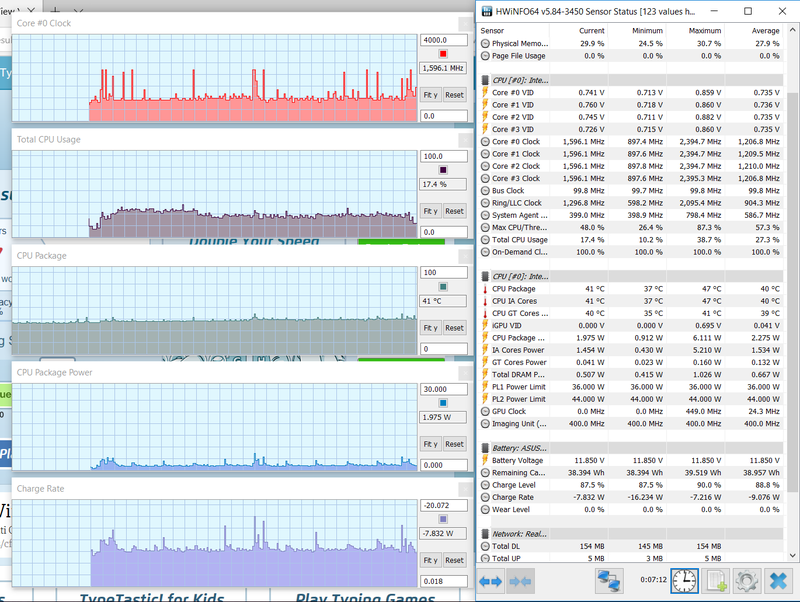 12.2 W (~3 h 30 min of use) – heavy browsing in Edge, Balanced Mode, screen at 30%, Wi-Fi ON. Keep in mind our unit came with a spinning HDD, the configurations with an SSD will run slightly more efficiently with basic tasks. Asus pairs this with a 65 Wh charger with quick-charging and a full-recharge takes around 1 hour and 30 minutes, with 60% of the capacity able to replenish in just 50 minutes. The Asus VivoBook S530 will be available worldwide in July 2018, with some variants selling as the X530 or F530 in some regions. The base models should start at around 500 EUR here in Europe, with the mid-range configurations selling for a few hundreds extra. In the US Asus will bring the VivoBook S530UA configuration with a Core i5-8250U processor, 8 GB of RAM, 256 GB SSD and the IPS panel, with a list price for $699 at launch. The Core i7 configurations should also be available later on, as well as the UX530UN models with Nvidia MX150 graphics. 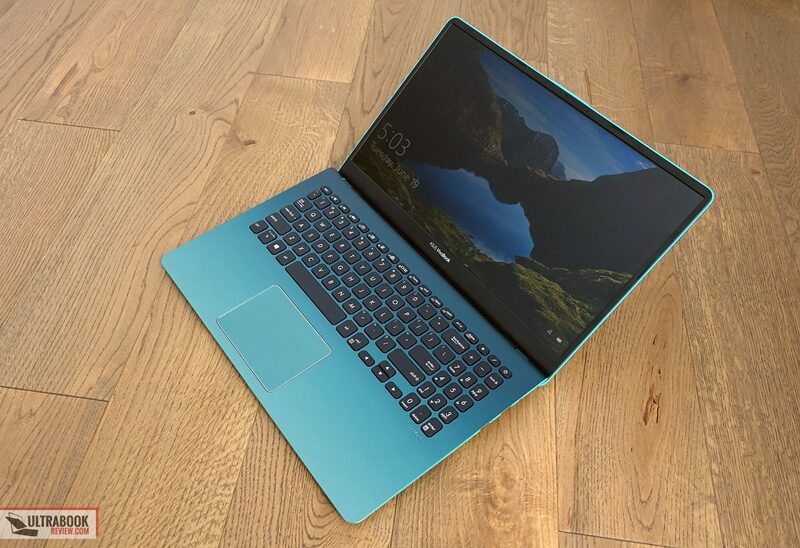 The VivoBook S530 improves on last year’s popular VivoBook S510 and should be one of the best buys in its class of compact and affordable all-round computers in 2018. Most of these changes are aesthetic though, with a new design and new color schemes, but with some functional updates as well, like the modern hardware, new keyboard, speakers and webcam. Nothing substantial has changed on the inside though, where the S530 still bundles a 42 Wh battery and a simplistic cooling solution, which keeps the S530UA variants at bay, but might struggle with the UX530UN builds where there’s also an Nvidia MX150 graphics to cool. There’s also the rather dim IPS panel that you’ll have to accept, as well as the fact that this year’s iteration is a bit heavier than the 2017 model, but still remains compact and light in its segment. 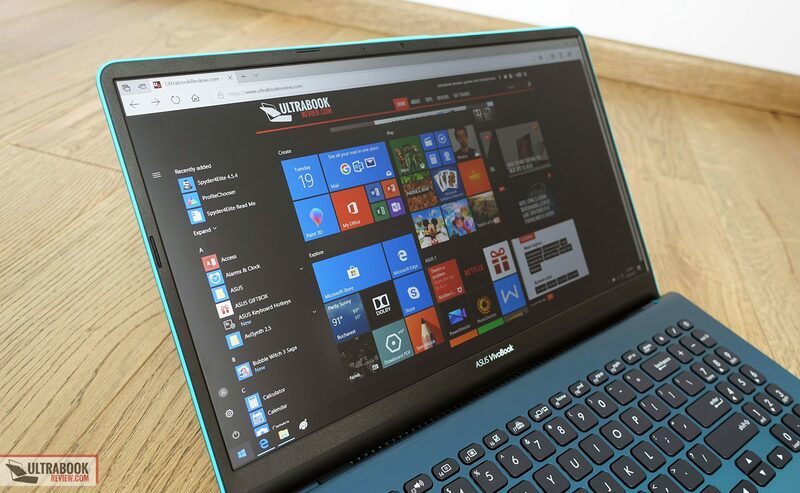 All in all, the S530 is a good laptop in its niche and a breath of fresh air, at least looks wise, with up to date hardware and an affordable price tag. You’d still have to accept the compromises in battery size and screen brightness, and if these don’t rub you the right way, you can also have a look at the competition, like the Acer Aspire 5 or the 2018 updates of the Lenovo IdeaPad lines. That’s about it for our review of the Asus VivoBook S15 S530UA, but the comments section is open if you have any suggestions or any questions, and we’re around to help out.